Heat oven to 400°F. Spray 10-inch cast-iron or stainless steel skillet with cooking spray; set aside. In large microwavable bowl, mix broth and beer. Microwave uncovered on High 3 minutes. Add seasoning packets to broth mixture. Break noodles in half, and add to bowl. Microwave 6 to 7 minutes, stirring once, until noodles are soft. Tear 6 slices cheese in 4 pieces each; stir in until smooth. Pour noodle mixture into skillet. 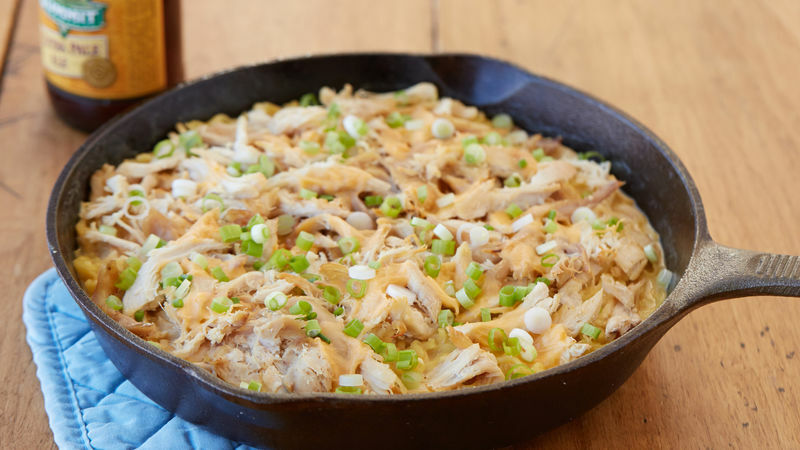 Top with chicken, then tear 2 slices cheese into long, thin strips, and place on top. Bake 10 to 12 minutes or until noodle cooking liquid is almost completely absorbed. Sprinkle with green onions. No need to cut those slices of American cheese. Just fold them in half, then in half again to make quartering them a breeze. Our recipe was tested with a pale lager, but feel free to experiment with your favorite brew.